We continue our Spring focus, noticing the natural world waking up. We shift our attention from eggs to trees. We note the new growth — both foliage and flowers — and we consider the life that trees support — starting with eggs! We laminate the children’s individual eggs from the prior class period and invite them to cut them out. The eggs are now shiny and most children welcome the challenge of cutting the thicker material. We revisit the Family Share in which children consider a creature that hatches from an egg. Children reflect on their knowledge of hatching critters as they cut. We decide to make a giant nest for our eggs. A few children team up to draw and cut out construction paper twigs, then glue them onto a large paper. Their collective investment builds as each child adds their egg to the giant collaged nest. 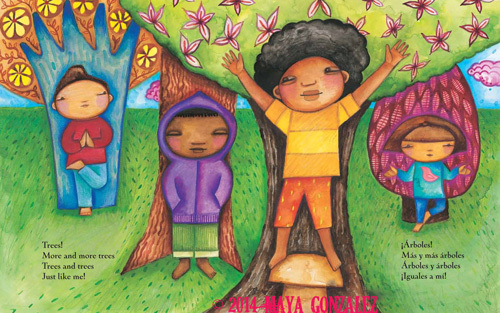 We center Maya Christina Gonzalez’s stunning book to ground some of our exploration. 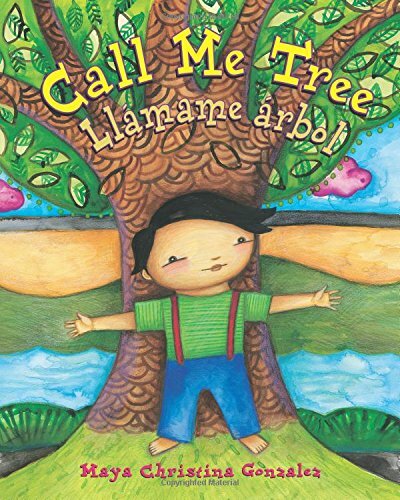 The colorful illustrations, integrated use of Spanish, inclusion of characters with a variety of skin tones, and gender-neutral references makes this book one of my favorites. No matter how little or deeply children connect with the book, they are taking in life-affirming images, words and messages. At circle, we recite a part of the book and create a movement activity as seeds in the tierra (earth), sprout, grow and reach toward the cielo (sky). Offering this kinesthetic invitation deepens children’s investment in the story and brings the book to life. We gather the leaves from a nearby Camelia tree. Children use hole punchers to create holes in the leaves. They add those, along with pieces of clear straw “spacers,” and colored netting (from produce bags) to create leaf/flower necklaces. We venture outside wearing our new tree jewelry to get a closer look at the nesting robins. The nest is tucked among rhododendron leaves just outside our play yard. We bring a stepladder and children take turns climbing the rungs to take a peek at the robins. When we go on a neighborhood rain walk, we peer into the tree to see if the robins are home. When we scooter-board down the sidewalk, some look to see if they can catch a glimpse of our feathery friends. We’ll continue to monitor the nest over the next few weeks– witnessing the vibrancy of spring in its branches: Baby robins may hatch and those rhoddies will soon produce giant hot pink blossoms.